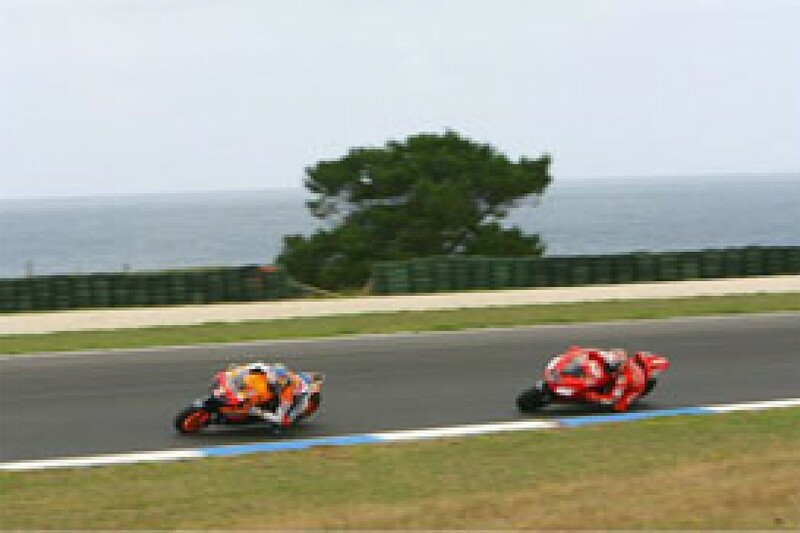 Casey Stoner may well be heading for a good run here. Two wins in three races is pretty good going whatever you are doing, especially when at a new team. On Sunday he took 19 points out of Valentino Rossi who is still the favourite for the title because of his sheer genius. Or is he? Stoner may now be getting to a point where he can say to the engineers at Ducati: "Hey, listen to me and make some parts to make us go even quicker." And may he do that quickly, because although Sunday in Turkey was a relative disaster for Rossi, he will not be down for long, during which time, Ducati need to get a march on the Japanese to build up a buffer of points. No different to what Hayden did last season with a 51-point lead in July last year. Is there a dilemma for Ducati to listen further to Stoner rather than to the multiple race winner and world champion Loris Capirossi, who is twelve years older? This has to be the time for Ducati to build further with the Aussie, with the new mellowed out father that is Capirossi as his faithful wing-man. These are truly crucial times for the Bologna team. Ducati are still hurting from last year's big crash at Barcelona, when one of their own in the shape of Sete Gibernau put his wheel just two inches to the right onto the white line that is marked on the road for F1 cars not to cross when exiting the pits. Down they all went, two Ducati riders injured and in the ambulance. It was not his fault, just a racing incident. But at that moment Capirossi took just 27 points out of the next five events before scoring a big fat juicy 25 in one go at Brno once he had recovered from his Barcelona injuries. Come the end of the season he was just 23 points off 2006 World Champion Nicky Hayden, and Bayliss took five off him in Valencia, so in actual fact it may well be Capirossi who had all the bad luck last year, not Rossi. Truth told, the 'disaster' of a result at Laguna for Capirossi in 8th (last of the five races when he scored just 27 points) was not all down to his injuries, but the fact that the Bridgestones underneath the Ducati were woefully inadequate. However, Bridgestone have just proven this weekend that they can get wrong circuits right with their top six finish at Istanbul. Even they were surprised! Some of the strength in their tyre choice last weekend came from their F1 experience, according to one Bridgestone manager in MotoGP. Being able to work under a similar ceiling to that in F1 with limited tyre choices is not something that has frightened them. The same is, of course, true of Michelin, who only pulled out of F1 at the end of 2006. But what Bridgestone did at times last year is bring tyre after tyre after tyre into garages, clouding decision making processes that are now clearer, because there are less tyres available with the limit of 14 fronts and 17 rears. Michelin will not be down for long. They will be angry at their own manufacturing mistakes in Rossi's tyre and bad luck of two potential podium riders being punted out of the race on the very first lap. But with China next, where they messed up with Rossi last year, they are on the back foot for the first time in a long time. All of the Bridgestone set up with Ducati is down to Livio Suppo who got them on board in 2005. "As long as Valentino Rossi is in this championship we have no chance of beating him, so we might as well take the left-field option and take some tyres that will win races comprehensively rather than trying to go for points," he said at the time. He was right then, and he is right now - but the difference now is that the combination of a tiny little European bike manufacturer and tyres made on the other side of the planet can win the title. Was that Ducati No. 27 or No. 1? The elation at the end of the Valencia Grand Prix seeing Nicky Hayden was tear jerking for everyone involved in MotoGP. Truly fairytale stuff after being in the gravel a fortnight earlier, knocked off by his own unapologetic team mate, losing the lead of the Championship to Rossi and suffering great pain from an injured shoulder were all memories he could forget for ever now he was the champion. Life was pretty darn good. Seems a long time ago that, for the World Champion who is now three races in to a 36-race contract with Honda and a bike that hasn't got any grunt. Even Dani Pedrosa cannot make it go fast in a straight line, and there's nothing of him for the bike to carry! Toni Elias is the one who rode like hell at the weekend, while Pedrosa also got a podium in Jerez so it is not a complete clanger, the problem is that Honda are now hurting through their sheer brilliance of engineering with the 5 cylinder 990cc machine. It had an extra cylinder that gave the bike such torque and leap out of a corner, the others where left standing. Now Honda have a 4 cylinder like everyone else and they can't rest on the strength of the extra cylinder. Personally I would have put an awful lot of money on the Honda 800 being a rocket ship. This is the Honda Racing Corporation for crying out loud. They do not make duff bikes, let alone engines! But it may be that many in the paddock ­ me included ­ got that wrong, and the signs have been there all along in that all the riders have craved more power since the first tests. The PR people say that it is because the Honda V4 is a completely new motorcycle and that they are starting all over again, unlike the Ducati and the Yamaha that have similar concepts to their 990cc bigger brothers, and so have similar basic data etc. That's spin, because you cannot believe that HRC do not have the talent and resources to give the engine a load more power to at least rattle on down the straights. These are the same people who made a V5 'because of the challenge'! If one believes that Honda and the Japanese railroaded through the 800 rules - and we'll never know who did what in any MSMA meetings - then we have a formula that has resulted in Honda making a bike that is lacking in power and a need to be braked at the last possible moment into corners. That leaves the 49kgs of Pedrosa slow on the straights, and vulnerable on the brakes as it is his weak area when controlling the bike. Poor Hayden has no chance to keep up, and that makes his 7th place in Turkey actually pretty fine. But for the World Champion, the worst thing has nothing to do with anything technical or even his riding style, it's that the Ducati No.27 that won the race is the bike that he could be riding. The American had a Ducati contract in front of him in Malaysia last year, but he signed for Honda come Motegi, one race after. I wrote at the time that Hayden may well have actually have been signing for the last three races of the year when pen went to paper at Motegi, but no new parts came for his individual Honda V5 that engineers stood by as being 'a test bed for the 800 in 2007' at a time when he was truly desperate for a clutch that worked. Then his own teammate knocked him off at Estoril. It couldn't get any worse coming into that last race at Valencia, a do or die duke out with Rossi, but Nicky rode out of his skin and won the title, proving that it was all worth it and everything would change because he was the MotoGP World Champion. How that Ducati No. 27 looks sweet to Hayden. Over the Spring break ideas were floated, at a meeting of MotoGP teams, about trying to discover how more money can flow into the MotoGP paddock. More paddock passes, the attitude of journalists, grandstand seating, the TV show, the spectators at the track were all tabled, and the most discussed idea aired was about an exclusive 'inner paddock' only for MotoGP teams. This is nothing new. Exclusivity is something human nature cannot ignore. There are a certain number of properties in posh areas of London and they sell for bonkers figures. A Rolex Daytona in stainless steel is worth double list price when you walk out of the shop; but they've reduced the production of them in Switzerland to keep the exclusivity factor. I want to ride a Ducati Desmosedici for an afternoon at Mugello, but it's never going to happen! We are in nature curious, inquisitive, nosey and, certainly in the world of the Grand Prix team manager, jealous of what others have. Look up avarice in the dictionary. So would the inner paddock be a good idea? 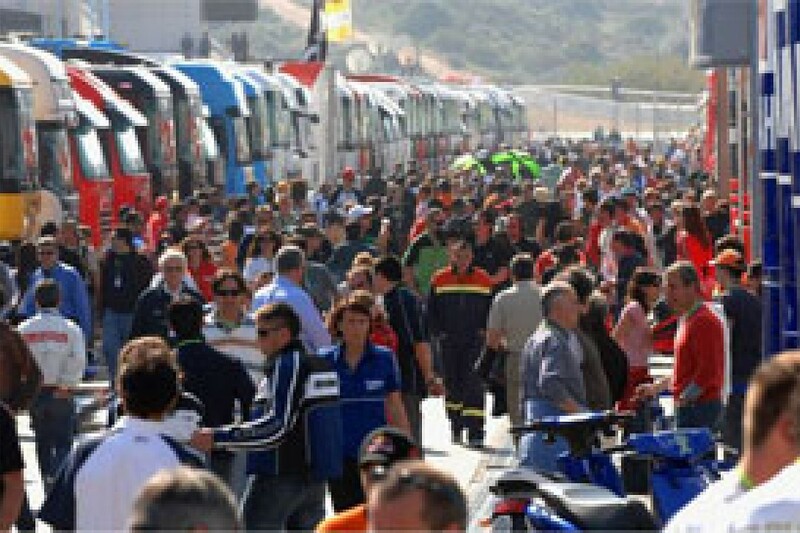 The MotoGP managers say that it is, because right now the napkin supplier to a 125cc team finishing 31st every week can still rub shoulders with Valentino Rossi, sit in the same 'paddock' grandstand as the Marlboro boss, and get the same buzz of being amongst all the big hitters of the MotoGP world. And all he may have done was supply some napkins, pay a few thousand euros for a sticker on the 31st placed bike and secured a pass for ten races for himself and his girlfriend. Napkin Inc. pays the expenses, he gets a real buzz, sees some history being made, and goes home a happy, sunburned man. Looking at things the other way around, the Marlboro bean counter pays millions and millions but gets his VIP guests to rub shoulders with fellow sponsors ­ six thousand of them in the Valencia paddock ­ and wonders where his exclusivity has gone? Many don't like the idea of an exclusive paddock, but an inner sanctum for MotoGP sponsors will be no different to going to watch the Rugby at Twickenham. You pay your £50, go through the turnstiles, and you see the match. There are no £10 seats next to the £50 GBP seats! Harald Bartol of the 125 and 250 KTM squads says: "What problem is there in 125 and 250? We have sponsors and we race. We are not complaining." Dani Amatrian of Jorge Lorenzo's Fortuna 250 team says: "Maybe the paddock should learn to speak Spanish not English. Go and have a look at the sponsors on my bike." Emotionally charged comment, Dani, but you have a point. The best one has to come from a man who may soon wield a great deal of power in the paddock. Giampiero Sacchi of Piaggio oversees the Aprilia, Gilera and Derbi brands in 125 and 250. That's 24 of the 34 runners (70 percent) in 125, and 16 of the 24 runners (66 percent) in 250. "If they (the MotoGP teams) think that building a fence around them to get more money is the answer, then let them get on with it," he added. That is a comment that has many connotations. He has the power to not supply bikes to those classes, leaving a grid of ten 125s and eight 250 bikes to line up. The reality of Sacchi pulling it all is remote, as he makes cash from leasing all those bikes, but you never know if he might get a call from fellow Italian FG Sport to go and run a support race over there alongside World Superbike. 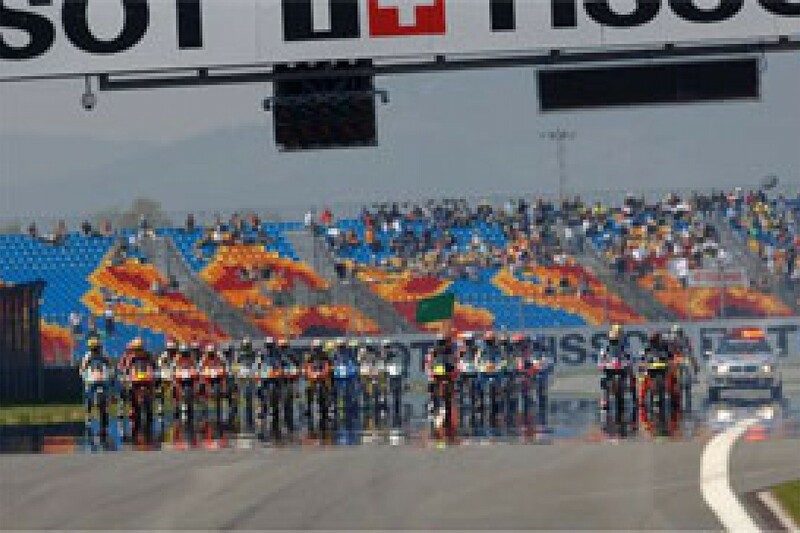 Dorna has a contract with the FIM to supply three classes of Grand Prix Motorcycle racing and that could leave Madrid in a very difficult situation indeed. Should the 125s or 250s be a full world championship? That is a point that Kenny Roberts has come up against many times when looking for sponsors. In the past he has had to answer that there is a 50, 80, 125, 250, 350, 500 and sidecar world champion! Talk about diluting the prestige of the big class, but just like getting rid of 50, 80, 350 and sidecar world championships, and indeed the 'holy grail' of 500cc they were not missed. There are no feeder 250cc championships on a national level to speak of - Honda agreed to keep the rules as such until the end of 2009 in order to get the 800 rule through in MotoGP - and if you are a bunny hugger, they're the evil two strokes that burn all that precious fuel we're going to run out of. Already ideas are being discussed about a 250cc replacement class; say a MotoGP2 class with a common engine made by, say Ilmor, badge it as a neutral engine, and then leave a free reign on chassis. Something like that that is actually copying what goes on in the GP2 single seater series which Lewis Hamilton won last year. He hasn't done badly this year in a McLaren, has he? So is the 'problem' in the MotoGP paddock just a flash in the pan? What is the exact problem? Is there a problem with 19 bikes on the grid, four of which get knocked off on the first lap in Turkey? The problem may be for people like Chris Vermuelen who rode the race of his life and yet was never seen on TV! Poor bloke slogged his guts out with a bent handlebar, a footpeg rubbing on the swingarm, the bodywork flapping and still he set the fastest lap of the race with two to go. Hero, but one of the many great things about MotoGP is that it is a short race and there is just not enough time to go back into midfield to just aimlessly look at bikes because a TV director has been told to by someone. Checa, Nakano, Tamada, Guintoli and Roberts Jr weren't seen, but they are being paid to ride motorcycle by their team or sponsors, who in turn get money from IRTA and Dorna to be there, while Dorna takes money from selling the show to TV stations around the world. Cycnics in the paddock say that there is no problem, except for the size of some team manager's wallets. "You're telling me that there are team managers in this paddock doing it all and losing money? Rubbish! At least Mario Illien had the balls to just pull out rather than be 'nice' to the sport by keeping going," said one big hitter. He has a point. Many sponsorships are about the guy in charge of the budget having a gold pass around his neck and a good slap up meal overlooking a good vista of sport, or whatever he was sponsoring. It is about getting a warm and fuzzy feeling of 'helping' out a team whether it's the local village cricket team, orchestra, air ambulance charity or church roof fund. I know that Samsung sponsored Crufts Dogs Show in the UK for many years because the big boss is a massive canine fan. He sponsored the event and got onto UK and American TV at a stroke. One major sponsor is currently on a MotoGP bike because the guy in charge of a large amount of wedge is a bike nut. He was the Trojan horse to get some hard MotoGP figures in front of the big wigs at HQ, who actually found the figures good value for money with regard to exposure and the amount of eyes who'd see the brand. Bingo. Everyone's happy, but the ball started off rolling into that boardroom by a fan! Now MotoGP may be doing well and it's the sport that I love, but it is not, contrary to some marketers, the biggest motorsport phenomena on the planet. And it never will be. Cars are always going to get more numbers as more people drive cars, and it's the same with football. F1 has big numbers and that's one of the reasons why they have lots of sponsors - so let's not try and beat that sport because never in a million years will MotoGP do those big numbers. What MotoGP has is a spectacular sport that sees the most incredible motorcycles, creates the most charismatic of stars and races the closest of races you've ever seen. I repeat my stuck record phrase that an F1 car goes around Barcelona 27 seconds a lap faster than a MotoGP bike, but everyone keeps telling me how they cannot possibly miss a MotoGP race, no matter how brain shrinkingly spectacular F1 cars are to see trackside. Dorna, the promoter of the championship, are genuinely trying their hardest here to solve a problem as they are in the food chain, but maybe the wrong door is being knocked on by the teams? There is no perfect solution to this situation so it's going to run and run this season, which is a shame for the fans who enjoyed yet another thrilling day at the races last Sunday. The same fans who have a significantly smaller wallet than every single team manager in that paddock.